Moto Fest “Bakadjik” 2011 near Yambol, Bulgaria. 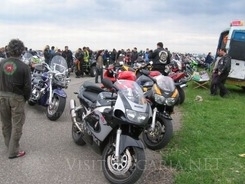 For the twelfth time Moto Club Red Riders MC organized the traditional Moto Fest “Bakadjik”. The event will be held in the area Bakadjik near Yambol on 06 – 08 May 2011. Part of the events are Stunt Bike Show and Drag Rase. Competition between stunt men in “Tenevo” track will start at 01:00 PM on May, 7.